NAD Electronics just announced the immediate availability of three new home theater products that combine performance with simplicity while offering a complete array of features and technologies sure to satisfy the most avid AV enthusiast. • Learn more in our AV Preamp Review section. 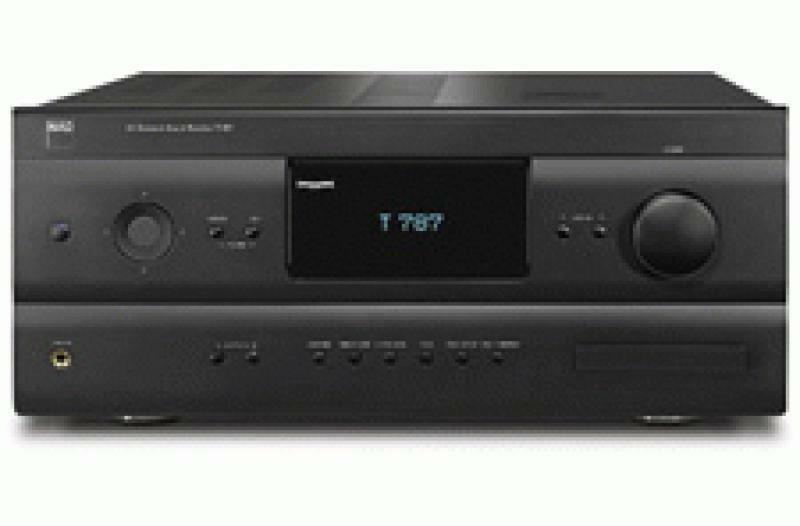 The NAD T 187 AV Surround Sound Processor ($3000 MSRP) T 787 ($4000) and T 777 ($3000) AV Receivers all feature the company's exclusive Modular Design Construction (MDC) designed to help prevent early technology obsolescence, instill confidence and protect the buyer's investment. And like all NAD products, the new models are dedicated to a "less is more" approach, avoiding needless features and directing the investment in areas that have proven to be important and add value. With digital technology, the current trend is to build highly complex AV receivers but the fast rate of changing technology quickly makes today's state-of-the-art obsolete. MDC is an NAD feature that offers the owner an easy upgrade path to future technologies, protecting their investment from technology obsolescence and ensuring long-term satisfaction. Now in its seventh year, with three generations of MDC Upgrade Modules, Modular Design Construction is a proven program. MDC Upgrade Modules are replaceable circuit modules that update the digital technology of the AV receiver or preamp processor to new standards and features. So instead of buying a completely new unit for the next version of HDMI or new surround modes, owners of an NAD T 787, T 777 or T 187, can simply purchase the required module, if and when needed, for a fraction of the cost of a new model. NAD uses multiple high power DSPs in the T 787, T 777, and T 187 to implement lossless HD surround formats from Dolby and DTS. Each model also features NAD's non-logic matrix surround mode called EARS (Enhanced Ambience Retrieval System), which allegedly gives stereo recordings a completely natural and spacious ambience. Premium 24/192 analog-to-digital and digital-to-analog converters are employed to retain the full detail and resolution of high definition material. Audyssey MultEQ XT is also provided for easy speaker setup and digital room correction. The T 787, T 777, and T 187 all sport 7 HDMI inputs and 2 outputs to handle the most ambitious system architectures. With full support for HD and 3D Video at resolutions up to 1080p at frame rates of 24, 50 and 60FPS, the new AV collection can handle all present HD formats. NAD rates its receivers with a difficult 4-Ohm load, with all channels driven simultaneously, over the full frequency bandwidth (20Hz - 20kHz), and at rated distortion. This is the Full-Disclosure rating method on which all of the brand's amplifier and receiver specs are based and a far cry from the most often used FTC minimal requirement of using an 8 Ohm load, any channel (singular), at a 1 kHz frequency, with no distortion specified. NAD's Full Disclosure Power Rating is an attempt to bring a broader understanding to the power rating issue. Powerful enough for a multi-seat theater, the 7 x 120W, T 787 includes two high-current Toroidal. One power supply is dedicated exclusively to the front left and right channels for dedicated music listening. The T 777 is a 7 x 80W AV receiver that can power home theaters. Like its more powerful T 787 stablemate, the T 777 uses NAD's exclusive PowerDrive circuit. The T 187, T 787 and T 777 are equipped with seven HDMI inputs and two outputs, as well as digital coaxial and optical inputs/outputs. In addition to IP control there are IR outputs, 12V triggers, and an RS-232 port for easy connection to home automation systems. Speakers may be added in other rooms or 'Zones', and with a simple on-screen setup and the supplied second zone remote. Add the NAD IPD 2 Dock for iPod for control, charging and media display.